Book on Financial Instruments launching soon! 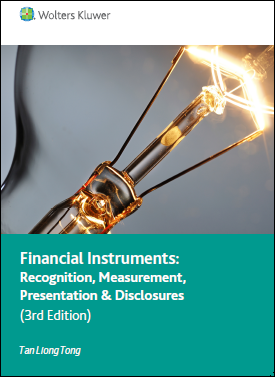 If you have always found financial instruments to be a complex and difficult topic, you need a copy of WK's Financial Instruments: Recognition, Measurement, Presentation and Disclosures. The newest edition of the book, written once again by the ever reliable Professor Tan Liong Tong, will be available for purchase on 15 April 2015! This book addresses the various Standards regarding accounting for financial instruments in Malaysia. The Standards that this book focuses on are MFRS 139 Financial Instruments: Recognition and Measurement, MFRS 132 Presentation, MFRS 7 Financial Instruments: Disclosures and the latest MFRS 9(2014) Financial Instruments (issued in November 2014). more detailed discussions of accounting for some common derivative instruments and complex implementation issues of the standards, such as the assessment of hedge effectiveness. The book also takes into account the upcoming Companies Act 2013, which, when passed, will introduce a No Par Value (NPV) share regime. This change will affect share capital, share buybacks, redeemable preference shares and distribution of profits, and has a significant impact on the accounting for financial instruments as a whole. Is your company preparing for full adoption of MFRS 9? This book will help you get there!